Home › Transgender, Transsexual, Trans › Discrimination, Equality, Civil Rights › Portland, Ore. Mayor says no trips to anti-trans Miss., instead, US Navy to bring ship to him! LEXIE CANNES STATE OF TRANS — Anchors aweigh! 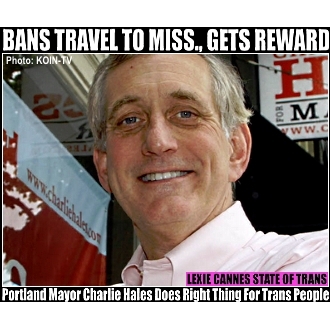 This is a surprising turn of events resulting from Portland Mayor Charlie Hales’ Mississippi travel boycott triggered by that state’s anti-trans/LGBT legislation. The U.S Navy has a new ship named after the city of Portland that needs commissioning and since the mayor can’t come to them, the Navy brass decided to bring the ship to him for the official commissioning. This is according to a news release from the Navy reported on Portland’s KATU-TV. The 25,000 ton USS Portland was launched earlier this year and plans are for the ship to be in Portland in 2017. IMO, the Navy taking extraordinary steps to accommodate the wishes of a community taking a stand against bigotry rates right up there with the Bruce Springsteen boycott in NC. My hat’s off to the parties (inside and outside of the Navy) involved that made this happen. Local stuff: Mayor Hales, of course, isn’t running for re-election so Portland’s new Mayor — likely Ted Wheeler — will preside, but no doubt Hales will get a prominent spot at the table.